This is the book to learn lace with. It goes from mesh and eyelets to more complicated designs with bulky yarn for instant gratification, fine yarn for extended pleasure, and some of everything in between. This is also the book to expand horizons. Interesting pieces worked in fascinating ways in exotic stitches for stunning results. Simple constructions with a twist. Unusual solutions to age-old design problems, like the top-down eyelet shirt that is shaped with specially treated yarnovers. This is the book, whether you're feeling impressive or uninspired, to keep on your coffee table. Glowing models in gorgeous garments, tidbits of wit and history, and Teva Durham's methodical encouragement. I learn something new every time I pick it up, and I've already read it cover to cover several times. The first couple chapters contain charming and inventive designs such as a military-style jacket, a leather cord belt, knee socks, pillow covers, and bloomers. But I want to highlight the designs that come next, starting with the Samplers chapter. The cover sweater, the milanese shower bolero, features four distinct yet related lace patterns. The stitches progress from the Shower Stitch on the lower bodice to the Milanese Stitch on the sleeves and are separated from the Wing Stitch on the upper bodice by a raised line of stitches. The ruffled border is actually a variation of Bear Track lace. The skirt of the shetland shawl dress is a Shetland shawl placed on the bias. A shawl with spaghetti straps is sure to stay on! I am always looking for other ways to wear the beautiful lace patterns that adorn these shoulder coverings. The gorgeous tiger and snail folkloric blouse has the makings of a fable in its name, but that is not its only attractive aspect. For one thing, it's red. I love red lace. The sideways snail shell edging is worked first, then stitches are picked up for the body and sleeves. There are cables around the drawstring neckline to act as ruching. Teva was inspired by Eastern European dance costumes when she designed this piece, and it shows both in the shape and the extraordinary level of detail. The Thistle Bodice below is from the Doily chapter and is a virtuosic reinterpretation of Marianne Kinzel's Balmoral doily. The thistle's calyx is featured several times in the doily and takes center stage in the top, manifesting itself at three major focal points. The patterns are clearly written and well laid out, with plenty of white space around the charts and clear schematics. Measurements are given only in inches. Although there are two sizes for the sock, there is only one size each for the two hats (17 1/2" and a very stretchy 19"). Skirt sizes go up to 2X (52" hip) and most sweaters go to XL or 2X, with notable exceptions being the eyelet tee which is offered in Girl's 4-5T through Women's Medium and the rose trellis blouse which goes to 5X (60" bust). Adrian Buckmaster's photography is masterful, capturing both the knitterly details and garment "story." Close-up pictures of swatches are also included throughout. The Palm Leaf Wrap is one of those designs that comes with a stitch pattern close-up. 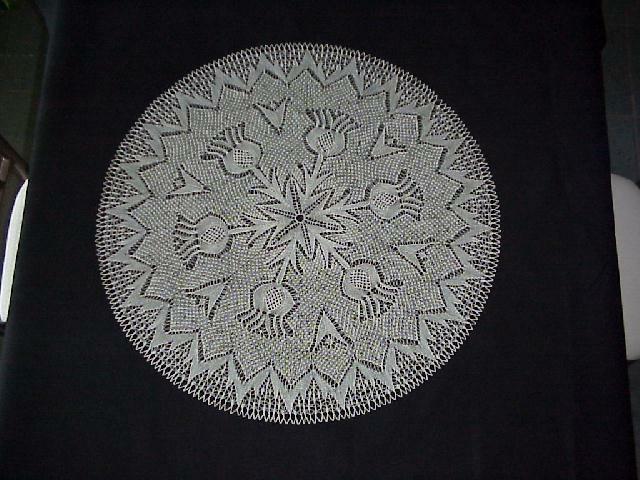 Based on a Herbert Niebling doily, the lobes include so many increases that the base appears perpendicular to the frond. Teva wanted to make a flat scarf, but the lace is every row. She worked out a way to work the scarf in the round, leaving lengths of yarn between each row and then cutting them down the middle, resulting in fringe. I found this to be an exhilaratingly fast and easy knit, and the result is stunning. Most impressive of all is that Teva finished this book after the death of her three month old baby boy. In her words, "I know that it is in the nature of humans to create and invent . . . extraordinary objects despite the limitations and trials of everyday life. This is perhaps our best quality." Disclosure: Kangath reviewed a copy of Loop-d-Loop Lace from her personal library. Kangath was not compensated for the preceding review. All opinions expressed in the review are the blog author's and are not necessarily the opinions of Stewart, Tabori & Chang or Teva Durham.